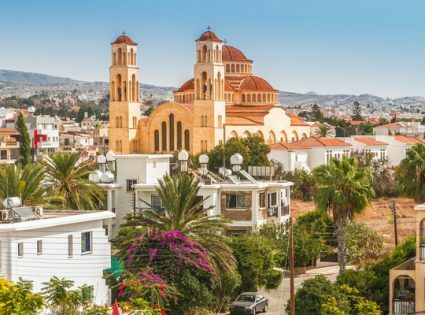 Cyprus is a small island off the eastern coast of the Mediterranean and for decades has managed to punch well above its weight on the tourist front. Ayia Napa continues to attract the young and hip crowds. Lemesos is starting to establish itself as a seaside destination receiving hordes of tourists flocking there every year. While Paphos is enshrined in folklore as the place to see the birthplace of the Goddess of Love. Here we discover some of the hidden gems of this beautiful island of rural Cyprus. While these towns are awash with visitors from all over Europe and beyond, more and more people are beginning to realize that the rural side of Cyprus is just as beautiful and scenic as anywhere in the Mediterranean region, and packed full of interesting places to spend your days. Wine lovers will tell you that Cyprus is a wine producing heavyweight that has some first class wine routes to explore. If white wine is your weakness, take in the Vouni Panagias to Ambelitis wine route. The local Xynisteri grape is well known and with many wineries spread out across the area, you will get plenty of opportunities to experience it in all its glory. Alternatively, take a tour along the Krasochoria route and sample one or more of the ten wineries on the route. With the lovely warm weather and outstanding views, what could be better than sampling some of the best wine in the world while surrounded by the best of Cyprus’s beauty? Fun Fact: Many routes are walkable if you do not trust yourself to be restrained and not go over the drink and drive limit! There is nothing more relaxing than getting in and amongst nature and exploring the local ecosystems of the island. If you are a nature lover, you’ll love Cyprus. There are many specialist nature trails that you could follow, including one located at Pitsylia. This mountainous region on the eastern side of the island has a variety of fruits growing amongst a notable number of Byzantine churches that litter the landscape. Take a picnic, explore the ruins, walk the dog – the choice is really up to you. More often than not you’ll end up at a place of natural beauty with great views, so make sure you have your camera handy or all that walking will be in vain. There is something about cycling that is lovely and relaxing (providing it is not uphill), and pleasant weather and beautiful views can only add to the experience. There are plenty of opportunities to take to the pedals when in Cyprus, with Limassol amongst many areas which have cycle paths that tourists can explore. You’ll be able to rent a bike, so don’t worry about buying one or having your bike from home flown over at great expense. Not everyone considers cheap all inclusive holidays by the beach as their idea of heaven. But just because certain parts of Cyprus are well known for their sea, sand, sun and late night shenanigans do not mean that you should pigeonhole the whole island. Instead, take in all the nature that rural Cyprus can provide and experience what true Cyprus is really like.